Gesso Panel coated with Art Boards™ Panel Gesso on both sides. Gesso Panels hang without framing. Art Boards™ Natural Fiber Gesso Panels, for more information click photos above. Art Boards™ Natural Fiber Art Panels are 3/8" thick and formaldehyde free. Both front and back of the gesso panels are sanded and sealed with Art Boards™ Panel Gesso which is a special acrylic gesso that is specifically formulated for rigid surfaces. Coating both sides with gesso insures that the panel is sealed, balanced, flat and true. Painting surface is finely sanded, sprayed with gesso, and dried thoroughly. The process is then repeated until the gesso panel has a build up of 7 successive layers of smoothly sanded gesso. 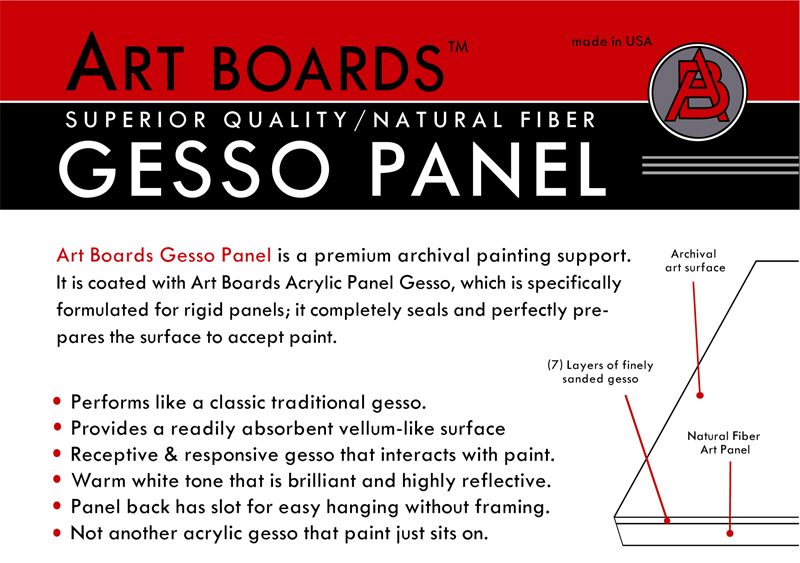 Art Boards™ panel gesso completely seals and perfectly prepares the painting surface to accept paint. Gesso Panels hang with or without framing from recessed hanging slots. drawings, prints, sculpture, and artist supplies. 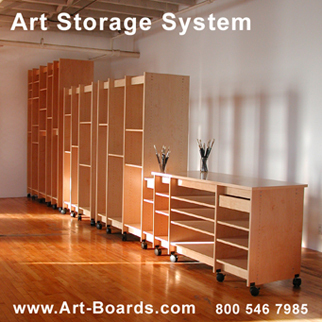 The Art Storage System by Art Boards™.